Cupping Therapy kind of scares me. First of all, don’t be scared. There is good reason why cupping therapy has been around for thousands of years: it is effective. The marks look like they hurt, but they aren’t bruises, and don’t feel like bruises. Occasionally people report some soreness, but usually the skin is just a little more sensitive. 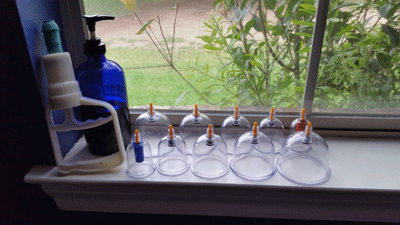 The intensity of cupping therapy can be adjusted to the tolerance level of each individual. For the first minute, a cup can feel pretty intense. After that, you can still feel it pulling, but the volume of stimulation (pain) goes down significantly and most people can’t really sense them by the time we take them off. Why would someone get cupping therapy anyway? A Doctor of Acupuncture will use cupping therapy along with herbs and needling to treat many conditions. In my practice as a Licensed Massage Therapist and an Advanced Cupping Practitioner, I am focused on achieving pain and tension relief. My technique and theory is informed by and focused primarily on the muscular system, nervous system, and connective tissues rather than the extensive and complex Traditional Chinese Medicine system. My own experience with cupping and my observations of my clients’ experiences are summarized below. Myofascial pain, muscle pain, nerve pain (if caused by entrapment), and some kinds of joint pain. I’ve been a massage therapist for 12 years and a cupping therapist for 4. It is by far the most effective method for pain relief I have ever come across. Cupping achieves this relief by unlocking tension, lengthening the muscles, and increasing range of motion. I would estimate between 80 and 90 percent of the clients I’ve had who have tried cupping find it absolutely fabulous, and end up preferring it for pain and tension relief. There’s a pretty good chance it could help you with bursitis, sciatica, migraines (caused by tension), old injury pain, and shoulder, low back and neck pain. Are you one of the many of us who just can’t seem to relax or take full, deep breaths, even when you’re not in a rush? Maybe a beer or a glass of wine at the end of the day helps you to rev down. So many of us now are living our lives in fight-or-flight. Our bodies are dealing with a constant barrage of stimulation and stress, and they stay in a state of crisis. When we are in this state, our body’s energy is directed to being ready to fight off an attacking bear, and our built-in repair mechanisms get postponed until the threat is resolved. (The innate intelligence that helps our body has to stay in an optimal state is drowned out and digestion, immune response, tissue repair and detoxification are all impaired if not halted depending on the level of stress.) Unfortunately for us, driving down 290, being late, or getting in an argument with a loved one, can put our nervous systems in roughly the same state as the threat of deadly harm. We are hard-wired to survive, and our mental minimizing or ignoring or normalization of these threats does nothing to override primal survival mechanisms. We live our lives at such a fast pace these days, that sometimes we get stuck in this crisis/survival state and are no longer able to really enjoy our lives or be grateful for what we have. We are in a cycle of “what’s next”, and self-care seems like a hippie/yuppie joke. Well folks, this is how we get old fast. Let’s calm down and slow down. Cupping therapy activates your parasympathetic nervous system- which takes you out of panic, and back into your body and the present moment. You may even feel like yourself again, if you remember what that feels like. 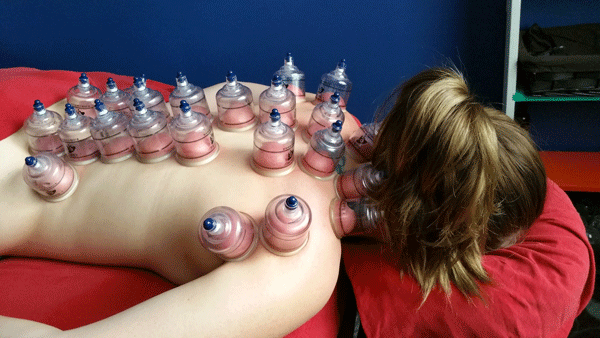 Cupping therapy is like a vacuum cleaner for your body. Sort of. When your muscles get tight and stay tight, they are crunching down on your smallest blood vessels (capillaries) and the blood stops flowing. The muscle cells use up all the nutrients, oxygen and hydration in the little bit of blood that is stuck there, and replace it with cellular wastes, like carbon dioxide, lactic acids and sticky proteins. This is why your tight muscles feel like beef jerky. They are dehydrated. If you are wondering why those stiff spots are sore, this is one of the reasons why. Those acids aren’t being flushed out of your muscles. The suction from the cups pulls the whole mess of dead blood and toxins to the skin layer (hence the markings). At this point, your lymph and blood carry the toxins to your organs of elimination. Cupping is an excellent addition to any kind of cleanse, provided you don’t have any contraindicated conditions. Even on its own, cupping therapy is a strong detox and it is strongly advised to drink plenty of filtered water before and after your session. Is Cupping Therapy for Me? Probably! Book a session with me at Family First Chiropractic, and let’s find out!